Here's the best of healthy recipes for kids. Making an easy healthy breakfast for kids they love! 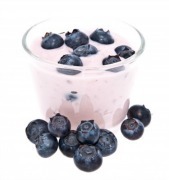 With a morning milkshake or yogurt they can add ingredients they love. You might have to borrow from your kids snack ideas at first. Give choices. You'll have to plan and try different combinations, but you will be on your way to easier healthy meals for kids. Blend until smooth, and add ice cubes and berries if you want. This recipe is for one person, so multiply by the number of people. For easy healthy meals for kids, see "Healthy Breakfast Recipes for Kids" by Ashlee Meadows. Best healthy breakfast for kids? Eggs – scrambled, an omelet or simply fried or cooked, with veggies in or on side. How much planning and prep time do you have? To get a new routine going, you may need to get things together the night before. It may take effort to change from grabbing processed insta cereals laden with sugar, and to make instead wholesome cooked grains with fruits, seeds and nuts! Even non-instant rolled oats can be ready in minutes, so don’t go for the sugar-laden insta stuff! Add quinoa for a protein rich variation, or chia seeds, hemp seeds, sunflower seeds when cooked. I just bring it to a boil, cover and let sit for 5 minutes while I’m getting everything else ready. Eggs can be quick, and if you have time, you can add red peppers & veggies to make an omelet to fried eggs. Smoothies need to be planned ahead, but you can use our starting recipe, and gradually add veggies for green smoothies. Kids will notice the green, but the taste will be sweet because of the fruit, so go ahead and add spinach or kale! 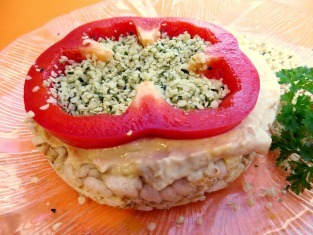 Put sesame seeds and red pepper on top of rice cracker and hummus, for a fast healthy breakfast for kids. Planning ahead to have things on hand to make veggie sticks is so important to having quick healthy snacks for kids. Of course, spreads like hummus and cream cheese for rice crackers to be topped by red peppers, seeds and veggy decorations, can be quick -- with a bit of planning! 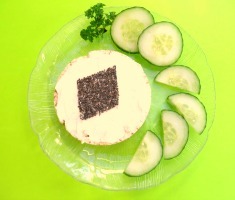 Here, we put poppy seeds on spread on a rice cracker. It is fun to make shapes - heart shapes with seeds on a rice cracker. Fun and filling! All good kids snack ideas should include healthy basics. For special occasions you'll need a healthy chocolate chip cookie recipe! Get them used to quality ingredients! Here's an easy delicious recipe for chocolate chip cookie oat chews. 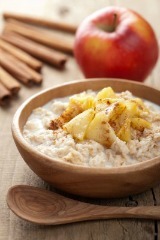 •	Combine the rolled oats, eggs, water and butter. Stir in nut butter and then the other ingredients except the pecans. •	Form into balls and place on a greased cookie sheet. •	Place a pecan on top of each ball. Bake at 350 degrees for 10 to 12 minutes. Makes about 24 balls or flatter cookies if pressed with fork. Happy baking these yummy healthy chocolate chip cookies that are packed with nutrition! Children love to cook, and even those as young as three or four are drawn to the kitchen with a tremendous sense of curiosity. Salad People And More Real Recipes is for pre-School to Grade 3, this healthy eating cookbook encourages kids to be creative and make their own miniature Salad People out of cheese, fruit, vegetables, and pasta, for healthy kids snacks. Tiny Tacos are tortilla chip sandwiches of refried beans, guacamole, salsa, and grated cheese. Uses real food, the nutritious and delicious kind –low fat, low sugar, and meatless. A Very Slightly Messy Manual has great recipes for beginning cooks, including fried eggs, applesauce, and tuna wiggle sandwiches. Includes recipes for non edibles such as face paint. Teaches kids recipes -- healthy meal ideas for kids -- and they can help with family cooking and have fun. For grades 4 to 6, an upbeat, general cookbook written from the point of view of two young people interested in making things that are delicious, nutritious, and fun to make. We hope you'll be inspired to plan your own healthy kids snacks and take our healthy recipes for kids as inspiration for your children. 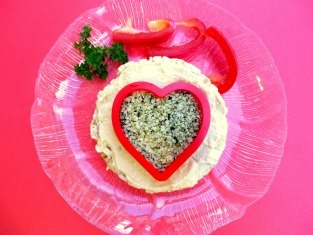 Please send us your favorite healthy recipes for kids that they love some of the time, or all of the time. Good luck, and let us know how you make the best healthy meals for kids!